Yes, Andre Iguodala was named the Most Valuable Player of the 2015 NBA Finals on Tuesday night. But even though he's a confident sort, heading into the series, he wouldn't have bet on himself to wind up shaking Bill Russell's hand and hoisting that particular trophy. "I'm not surprised, but I would have bet on — I would have bet on Steph," he said after the Golden State Warriors' championship-clinching 105-97 victory over LeBron James and the Cleveland Cavaliers in Game 6 at Quicken Loans Arena. That would've been a pretty reasonable pick. After all, Stephen Curry did win the 2014-15 regular-season Most Valuable Player award, and he was coming off a Western Conference finals in which he demolished the Houston Rockets to the tune of 31.2 points, 5.6 assists, 4.6 rebounds and two steals per game, shooting a scorching 49.1 percent from 3-point land on a whopping 11 attempts per game. Apparently, though, Riley's dad wasn't alone atop Iguodala's hypothetical, purely-for-entertainment-purposes-only betting slip. "I would have bet on Draymond," he said. I mean, sure, Draymond Green had a whale of a year. The Michigan State product rose from a spot as a rotation forward under Mark Jackson to the starting lineup under first-year head coach Steve Kerr after a late-preseason injury to incumbent David Lee. Once there, he firmly entrenched himself as one of the NBA's most versatile and valuable young players, finishing second in both Most Improved Player and Defensive Player of the Year voting while earning a spot on the All-Defensive First Team. Still, though: A Finals MVP bet? How do you figure, Dre? "Draymond's been great for us all year and [he's a] very, very high-IQ guy," Iguodala explained. "This is the type of series where he can get triple-double numbers every night, and we saw it in the Houston series, and I knew it would carry over." It didn't carry over right away, though. Early in these Finals, Green seemed to bear little resemblance to the swaggering two-way playmaker who not only battled the likes of Anthony Davis, Marc Gasol and Dwight Howard in Golden State's run to the Finals, but filled up the stat sheet in the process. Through three playoff series, Green was producing at a pace that would have made him the 11th player in the last 30 years to average at least 14 points, 10 rebounds, five assists and 1.5 steals per game in the playoffs. Through three games against Cleveland, though, that dude was gone — Green was down under 10 points, eight boards and three dimes per game, shooting just 26.7 percent from the floor and 12.5 percent from 3-point land. On the defensive end, Green struggled with keeping energetic board-crasher Tristan Thompson off the offensive glass. When he had the ball, he seemed stuck between stations — he was turning down wide-open jumpers he needed to take to break the Cavs' conservative defense, and when he pulled the ball down to drive, he either careened headlong into massive paint-protecting Russian Timofey Mozgov or threw passes that seemed a half-step out of phase with his teammates' movements in the Warriors' whirring offense. "Offensively their plan was to take Steph away, take Klay [Thompson] away and force Draymond and Andre to beat them," Kerr said Tuesday. Iguodala had been more or less successful in doing so as early as Game 1, but Green seemed to be thrown off his rhythm. This was not the "playmaking four" who had helped turn Golden State into such an unguardable offensive problem all season; something was amiss. Kerr denied that, of course. "I don't know that Draymond has had struggles with" his playmaking, Kerr told me after the Warriors' Game 3 loss. "I think he's been good with that. He can catch that pass in the lane and make plays, and David [Lee] can do that, too. We can play them together, like we did at times. But I think both players are very adept at making that play." Lee, whom Kerr had largely excised from the rotation to make room for Green's ascent, made those plays better than Green did in Game 3, leading some to wonder whether he'd see increased minutes over the rest of the series. Internally, though, the Warriors saw what Lee had been able to do in slicing up the Cavaliers' defense as the short-roll man working in the screen game with Curry, and started salivating at the prospect of Green getting those same opportunities with the same sort of floor balance. 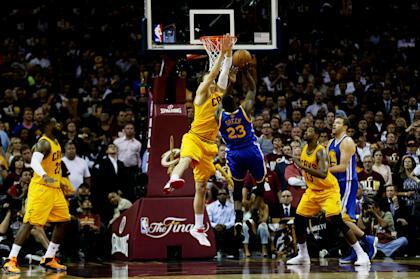 "In Game 3 we lost, but at the end of that game, David Lee made a couple passes to me," Iguodala said Tuesday. "We came back, we made a run. We were down 14, 15, and we cut it to 1, and David Lee did that for us. I think he opened Coach's eyes — like, 'If we do this, this could help.' That's when he put me in the lineup, threw Draymond in that spot D. Lee was in in Game 3, and that started happening." As much as the Warriors' fate depended on more fight, it also depended on more space and more speed, especially in trying to fluster a Cavs team that had a major size advantage on the interior but was left relatively thin on the wing, the area where Golden State's strongest. So Kerr — acting on the suggestion of special assistant Nick U'Ren — inserted Iguodala into the Game 4 starting lineup in place of center Andrew Bogut and slid Green up to the center spot. Small-ball groups with Green at the five were haymaker lineups for Golden State all year long, stretching opponents past their breaking point with too much playmaking and shot-creation to guard and overcoming size disadvantages with activity, smart switching, timely double-teams and seemingly endless length. In returning to those revolutionary roots, Green suddenly started to look like himself again. The challenge of checking Mozgov, despite giving up at least six inches and 30 pounds in the matchup, seemed to energize him. And now, after the Cavaliers trapped Curry and Steph dropped the pass off to him, Green was getting the opportunity to attack Cleveland's defense in a 4-on-3 situation where the Warriors' spacing was pristine, with shooters dotting the perimeter and no Bogut on the inside to clog the lane. Suddenly, Green was making decisive movements, firing shots when the defense sagged, driving to make plays and succeeding. And suddenly, the numbers started looking a lot more like what Iguodala would have bet on. Seventeen points on 6-for-11 shooting, seven rebounds and six assists in the Game 4 win. Sixteen points on 4-for-9 shooting, nine rebounds and six assists in the Game 5 win. And finally, on Tuesday, 16 points on 6-for-13 shooting, 11 rebounds and 10 assists — the first NBA Finals triple-double in Warriors franchise history — in the clincher. Over the final three games, he was every bit the multifaceted difference-maker that many (including me) expected to have a major say in how the series unfolded. He finished the postseason leading the NBA in plus-minus — the Warriors outscored their opposition by 192 points in Green's 784 minutes of floor time. Golden State was a whopping 16.7 points per 100 possessions better with Green on the floor than off it in these playoffs. Not bad for the 35th overall pick in the 2012 NBA Draft. It felt so quintessentially Draymond — in the moment of his greatest professional triumph, Green threw his head back, jutted his jaw out and had a hearty, sneering laugh at the haters. "I mean, that's what they said," Green said during his postgame press conference. "I won the National Player of the Year Award in college, consensus All-American. I made every, every single First Team All-American that you could possibly make, and I was a second-round pick, and a lot of people said I could never play in this league. Too slow, too small, can't shoot well enough, can't defend nobody. What does he do well? He doesn't have a skill. "I've got heart, and that's what stands out," he continued. "It was just one of those moments where it's like I've always been doubted my entire life." Draymond: “I’ve been doubted my whole life.” /Klay rolls into the interview room: “YES HE HAS!” Draymond: “Shoutout to Klay Thompson." Earlier, Thompson had waxed poetic about Green's contributions to the Warriors' run during his celebratory chat with ABC's Doris Burke. "Oh, his emotion, his heart — he brings it every night," Thompson said. "He's not afraid of the moment. He's not afraid of anybody, and he's one of the toughest competitors I've ever played with. He's so big to this team. It doesn't even show up in the box score every night, just his toughness and grit, and he has one of the brightest futures in the NBA." Shoutout delivered, Green reached back to reposition the chip on his shoulder. "They told me I couldn't do it," he said. "I could not play in this league. I read something after my rookie year like, 'OK, Draymond's pretty good on the defensive end, but if he don't shore up his offense, he'll be out of the league next year.' And I'm sitting here, NBA champion. "I mean, they can never take that away. They can still say, 'Oh, he's too small, he's too this, he's too that.' They can never take this away from me." No, they can't. There's a trophy, and there's champagne, and there's a celebration that I'm sure must feel unbelievable after six months of regular-season strain and two months of even-greater postseason stress. Come the fall, there'll be a ring. This simple fact — Draymond Green is an NBA champion, and one hell of a player to boot — is now written in indelible ink in the historical record. What comes next, though, is the interesting part. So what happens when the overlooked, undersized, unappreciated underdog becomes the toast of the town, the very model of a modern two-way power forward and, dare we say, a maximum-salary player in the contemporary NBA? Will Green still be able to muster the internal combustion necessary to play the way he has to get to where he is? [...] only minutes after the Warriors captured the title, Green was already calling other people out. "Everybody doubted us," he shouted at the top of his lungs in a manic postgame locker room. "A jump-shooting team can't do it. I'm too small. Charles Barkley, I do it for people his size and my size. That's why we're here. "As for the triple-double, it barely mattered in the moment to Green, although it surely will later. "I don't care about no numbers," he said, clutching the NBA championship trophy. "I helped us win, that's all that matters. And we're world champions."